I noticed my internet speed to be very slow especially when browsing and even downloading a few kilobytes file took several minutes to complete. That was after I installed Windows 10 creators update. Microsoft introduced the feature called Window Auto-Tuning in Windows 10 which basically improves the performance of the apps in the Windows store or programs that receive TCP data over a network and is enabled by default. In my case, I am experiencing slower Internet speed than usual data transfer speeds and connectivity issues. I tried googling for possible solutions to help me resolve the issue and found several tutorials showing the same steps on how to manage Window Auto-Tuning in Windows 10. First, I checked if I do have auto-tuning enabled by default by doing the following. Right click on the Start menu icon on the lower left of the screen and click Windows PowerShell (Admin). That launches a Windows PowerShell with elevated privileges that is needed to update the TCP parameters. Type netsh interface tcp show global and hit enter. The command above yields an output shown below. Then, I still tried running the following command which I got an “Ok” response. To verify if I successfully updated the status of the auto-tuning parameter I typed the command again specified in the first step to view the TCP Global Parameters state as you can see below. I wondered why the value was not updated. I tried running the command again and again to disable auto-tuning but nothing happened. I found an old thread in Microsoft’s forum site about TCP auto-tuning level. The solutions provided by the experts there didn’t really help me in my case. 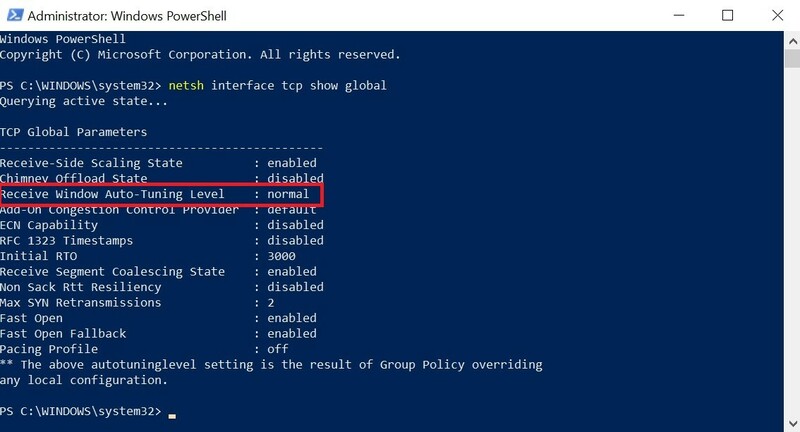 The warning message is clear that there is really a Group Policy configuration that overrides the auto-tuning level parameter. 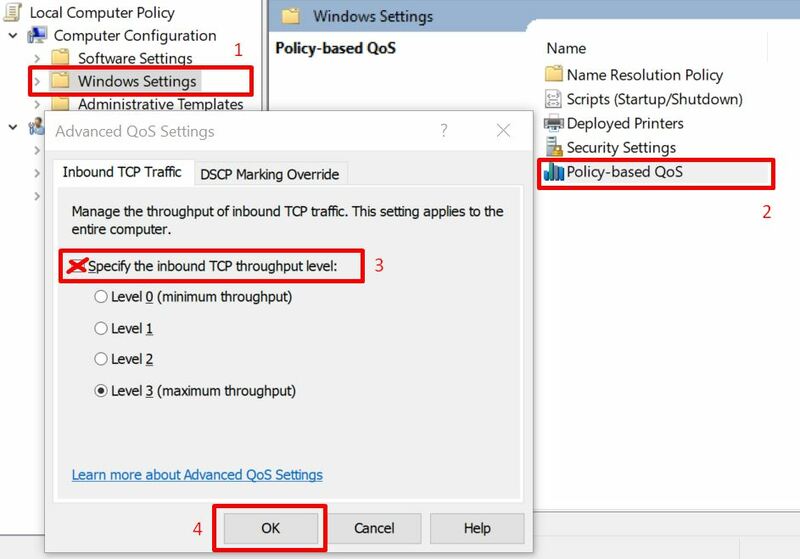 According to DriveTheLife, improper QoS settings can also result in the slow Internet after Windows 10 Creators Update or the Windows 10 Fall Creators Update. So I opened my Local Group Policy Editor to make some changes. Step 9. Un-Check the Specify the inbound TPC throughput level. Step 10. Choose Level 3 (maximum throughput) and click OK. The issue in my case is that the “Specify the inbound TCP throughput level” setting has been checked which is causing the conflict and is overriding the auto-tuning feature in TCP Global parameters. When I checked the status again, auto-tuning has successfully been disabled as shown in the image below. After I’ve successfully disabled auto-tuning, I can already feel an increase in my Internet browsing speed and downloads now instantly completes in few seconds.